When the Chernobyl reactor exploded in April of 1986, the Soviet Union at first tried to conceal the event, informing the citizens that "an accident had occurred" in one of the reactors, all while evacuating entire towns. It quickly became clear that the enormity of what had happened could not be hidden. When the reactor exploded, it threw a two thousand ton reactor lid into the air. The explosion released a cloud of Strontium-90 and radioactive debris, carried by the strong winds across the region of Pripyat. The intensity of the fallout was forty thousand percent greater than that released during the detonation of the Atomic Bomb on Hiroshima. The accident had to be contained in order to prevent radioactivity from contaminating other areas of Ukraine and Belarus. A group of eight hundred thousand men and women was assembled, comprised of soldiers, firefighters, coal miners, demolition experts, medical workers, and a Civil Defense brigade. 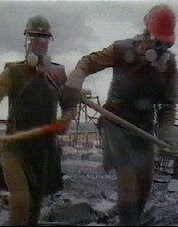 Clad in protective suits, they were charged with redirecting the flowing radioactive coolant water to prevent it from leeching into the region's ground water, as well as carrying all the debris to the remains of the Chernobyl plant, where it could be covered in concrete. They were called the Liquidators, and sometimes Bio-Robots. They knew that they had been deemed expendable. Unable to work more than forty seconds at a time due to the hazardous environment, they would haul a cart-load of concrete and scrap metal a few meters and then run away, to be replaced by another worker. Eventually it was all piled high in the shell of Chernobyl, whereupon helicopters blanketed the site in lead and boric acid. The entire process took eight months, and when completed the resulting structure was finally sealed in what was called "the Sarcophagus." For many of the Liquidators, its construction was their final act. The entire affected area is a vast wasteland of crumbling apartment complexes and abandoned vehicles, all soaking in radioactivity. It is cordoned off and referred to as the "Zone of Alienation." Of those that worked to contain the site, six hundred thousand suffered from radiation poisoning. Sixty thousand of those men and women perished, and one hundred sixty five thousand are permanently disabled from their injuries. For their sacrifice, they received minimal health care and compensation, with soldiers often being denied anything altogether as they were not "salaried workers." 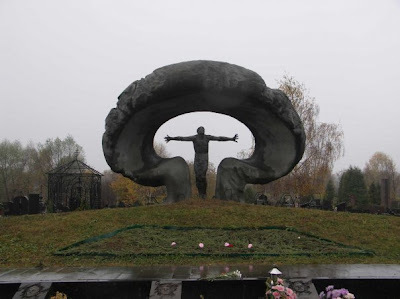 In 2006, the Liquidators finally received a gesture of gratitude in the form of a statue honoring them in a Moscow Cemetery. It provides a somber tribute to those endured a pocket apocalypse. Any updates about this ? Call it Pocket Apocalypse Now!